This knitting needle holder is so quick and so easy. It is the perfect solution to the needle chaos that reigns at my house. This one is specifically for double pointed needles. And there are lots of slots for the smallest sets in my holder. The best part of this project is that it really is quick, easy, and in expensive. 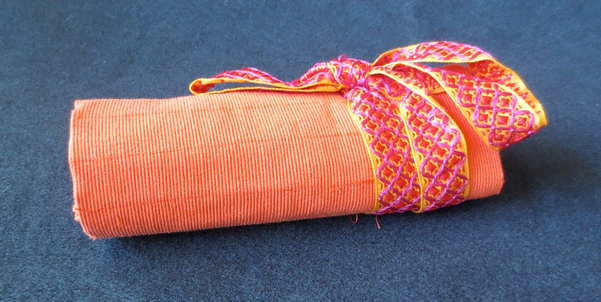 If you have sock sticks (shorter double pointed sets) you will want to add a shorter pocket to the outside. Now is the time to add that. 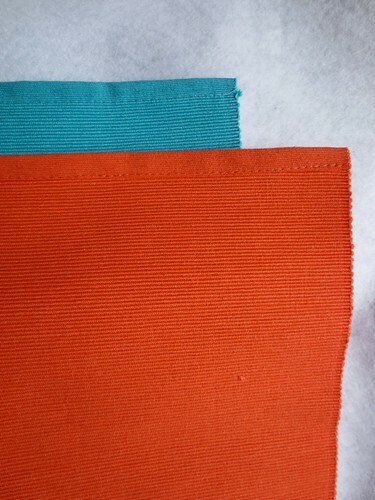 Turn the top edge of the pocket over and hem it close to the edge. Turn the other three sides in 1/2 inch and press. Pin the pocket in place about 1.5 inch from the hem, and sew down the bottom and sides, forming a pocket. 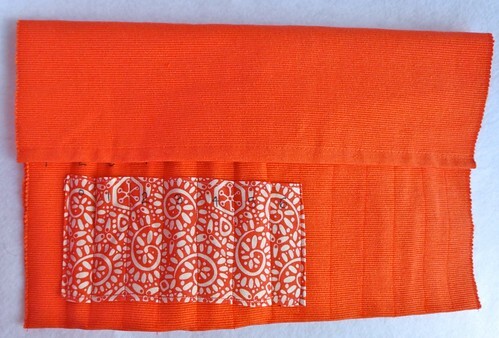 Turn up 5.5″ and sew the sides, creating a large pocket. 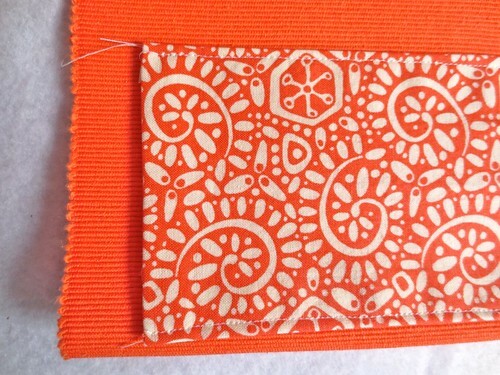 Using a ruler and a fabric marker, add evenly spaced marks to help guide the channels for making the needle pockets. Sew straight lines following your marks. 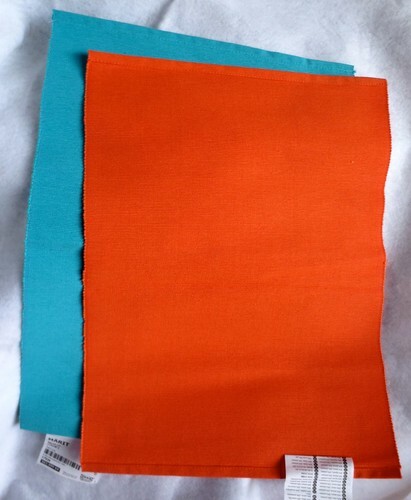 You will be sewing up through both the extra fabric and the main place mat fabric all in one seam. 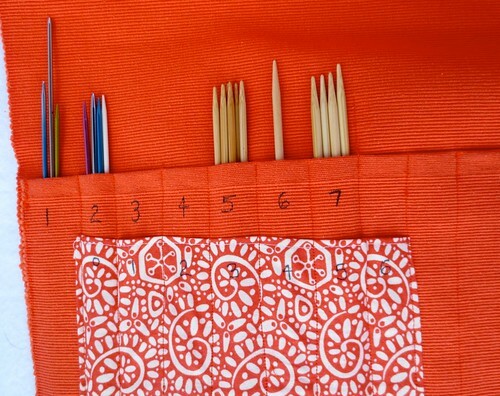 Using your sharpie, number which needles you want in each pocket. With a ribbon, tied, and ready to go. Totally digging those orange fabrics.Well done. I totally need to do this! 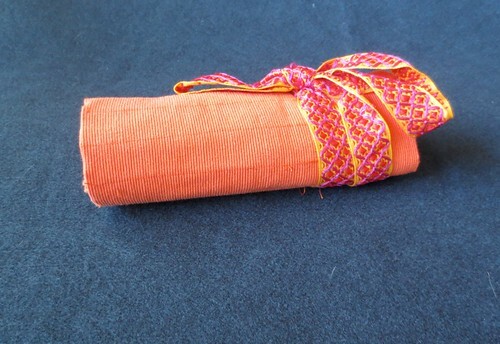 There is needle case in my home, too. This is so cute. I love using placemats to make stuff.